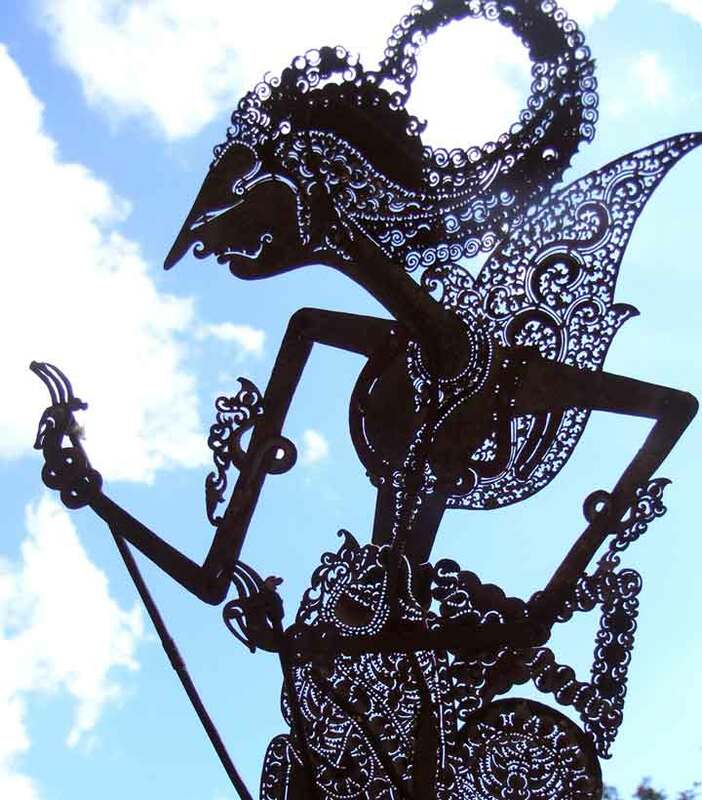 In the Java language, the word wayang means "shadow". If viewed from the meaning of his philosophy "puppets" can be interpreted as a shadow or a reflection of the qualities that exist in the human soul, like rage, virtue, greed and others. Wayang is the traditional art of Indonesia which is mainly developed in Java and Bali. Puppet show has been recognized by UNESCO on November 7, 2003, as the work of an amazing culture in the field of narrative story and legacy of beautiful and valuable (Masterpiece of Oral and Intangible Heritage of Humanity). This puppet show is basically a religious ceremony or ceremonies associated with the confidence to go "Hyang", performed at night by a medium (shaman) or treated by the head of the family by taking the stories of ancestors or ancestors. This ceremony is intended to call and connect with the spirits of ancestors to ask for help and his blessing if the family will start or has finished performing a task. Such ceremonies are thought to arise in the era of Indonesia or to Neohithik ± 1500 BC. In its development later this ceremony done by a person who has the expertise, or make it a permanent job, the so-called mastermind. Within a long puppet show and then continue to grow gradually but still maintain its core functions, namely as an activity associated with the trust and the education system. Regarding the type of puppet known by the Java community, the Wali in the Land of Java has been set up in such a way into three parts. First Wayang Kulit in East Java, the Wayang Wong or Wayang People in Central Java, Wayang Golek and third in West Java. Each highly bekaitan one another. Namely "Which one of Contents (Wayang Wong) and Which Skin (Leather Puppet) should be sought (Wayang Golek). As a tool to demonstrate a ceritra puppet played by a puppeteer who is assisted by several gamelan players and one or two people waranggana or sinden as a vocalist. In addition, a puppeteer can sometimes also have a special assistant to himself, in charge of organizing the puppet before the game started and prepare the kind of puppet characters that will be needed by the mastermind of presenting the story. Mastermind function here is to set the overall course of the show. It was he who led all crewnya to yield in the story line presented. Even to the scene of small-kecilpun there must be solidarity among all the arts crew. Thus, in addition required to be able to appreciate each character of the existing characters in the puppet, a puppeteer must also understand gising (song). Design floor puppet used in the game are straight lines, and in playing the puppet, a puppeteer is limited by the base used for stick puppets. In the puppet show known set of left and right sets. Set the right is a collection of character figures or warrior-knight defender of truth and virtue, while the left set of figures is where the rage. However this provision is not absolute. To demonstrate the various settings / decorations and a change of scene is usually used symbols in the form of mountains. Puppet show can be performed on the day or night, or day and night. Long show for a play is about 7 to 8 hours. 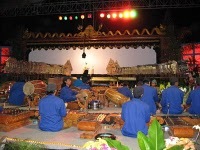 Musical instruments used in the accompanying puppet show is complete Javanese gamelan pelog and slendro, but if not complete is commonly used and the type slendro only. Vocalist daughter in the accompaniment of music called waranggono can one person or more. In addition, there is still a male vocalist called penggerong or wirasuara, which number 4 to 6 people and served to accompany waranggana or sinden voice "choir". Vocalist this man could be provided special or concurrently by gamelan players, so the gamelan is also penggerong.